Losing your Mum through death is a difficult grieving journey whether you are young or old. The death of your Mum ended her life but it does not stop your relationship or love with her. For some the mourning of their mum never ends. 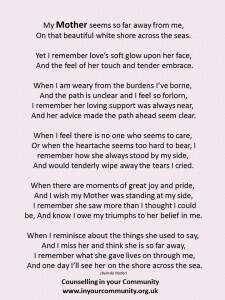 If your Mum has died there are times of year when it is more difficult than others and Mother’s day can be one of those difficult days. You long to send her a Mother’s day message but you can’t. Sadly Mother’s Day has been overtaken by commercialism resulting in the merchandise being in our stores a lot earlier than they used to be and they are everywhere. This can make it more difficult for those learning to come to terms with their loss. So, how do you cope with the death of a mother on Mother’s Day? Often clients tell me that the lead up to the day is more difficult than the day. They find that planning ahead for the day is a helpful for them. What you can do will depend on how you grieve and what are the things that help you. Some say that being with the other members of the family is important for them and doing things together whether it is visiting the grave or going to their Mum’s favourite restaurant or place or planting a tree in their Mum’s memory. They find this helps them to remember their Mum in a positive way. However, if you live alone or work away spending time with your family may not be an option. One way to help you deal with your emotions and your grieving process is to write. Writing can be therapeutic and is a self-help way of dealing with your grief. You could write a letter to your Mum, send her the Mother’s day message you would like to send or just write down how you feel. Sometimes writing down those emotions that we are feeling can help us learn to find ways of coping with them. Writing therapy does not have to be in narrative form, you may find that writing a poem may be an easier way to express your feelings. If you find that this does help your grieving process you may wish to pursue this further by having therapy through online counselling. If you are finding you are alone on Mother’s day and not coping with your grief you can always ring The Samaritans on 08457 90 90 90 who provide a 24 hour support telephone line. Broken a relationship with your Mum?